Look out for the DT Brown range of Spring and Summer Flowering Bulbs, available in stores from February until September. Featuring all your favourotes such as Daffodils, Hyacinths, Tulips and Dutch Iris, they make a reliable and showy addition to the garden every Spring. From June, you can be growing popular kitchen garden lines such as Asparagus, Rhubarb, Shallots and Garlic. DT Brown offers a truly comprehensive range of seeds, garden products and flowering bulbs to gardeners across the world. In the United Kingdom, DT Brown is one of the longest established gardening brands, having been started in the mid 1800s by the entrepeneurial Scot, David Thompson Brown. 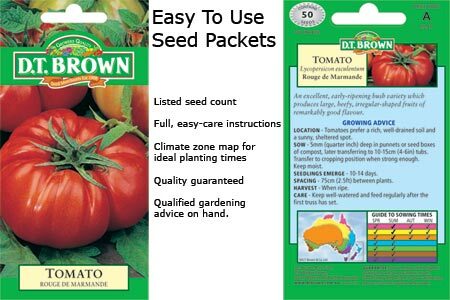 In Australia, DT Brown Seeds and Bulbs means great gardening products at best value prices. With products to meet the needs of Australian gardeners, our seeds are guaranteed to perform. You'll find DT Brown seeds and gardening products across Australia in your favourite value outlets. We guarantee all our seeds and if you are in any way dissatisfied with the results you achieve from your seed purchase, simply Contact Us and we will be pleased to offer you a replacement. We have redesigned our seed packets to make them easier to use, more appealing and better suited to the needs of Australian gardeners. Look out for your new look packets in store!